The kamara.hu chamber music festival, now in its third year, presents four days of concerts every November in cooperation with the Franz Liszt Academy of Music in Budapest. The Liszt Academy’s alumni rolls read like a Who’s Who of famous Hungarian musicians and the name of Georg Solti is naturally among them, a fact which his alma mater has honored by naming its smaller concert space after him (the academy is not only a music conservatory but also a concert promoter, putting on hundreds of events a year). Most of the kamara.hu concerts take place in the 300-seat Solti Hall, including the first two concerts reviewed here. 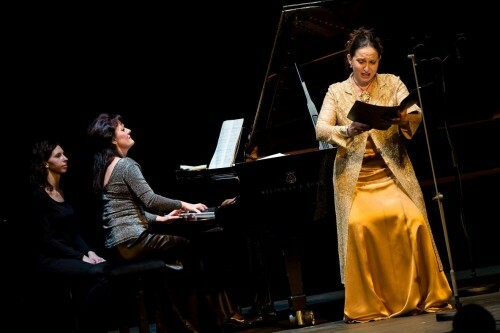 The opening concert contained a strong Lieder focus – one programming objective of the festival every year – with songs by Brahms, Schubert and Mahler. Marie-Claude Chappuis’ warm, smooth mezzo was very pleasant to listen to in this repertoire, and she had distinct ideas regarding style for each of the three composers. The Two Songs for Alto, Viola and Piano were ‘lieblich’ in the best Brahmsian sense, with Chappuis’ voice and Kim Kashkashian’s viola melding exquisitely in the second song. Solace and solemnity were present in Schubert’s Der Tod und das Mädchen, and finely balanced too, especially in Izabella Simon’s placing of the dactylic chords, which lent Death’s music a more supernatural than funereal character. Der Erlkönig and the Lieder eines fahrenden Gesellen were both given in less commonly played versions: the Schubert in an arrangement for voice and string quartet, and the Mahler with the original piano accompaniments. Even though I couldn’t shake the impression that the Mahler is better with orchestration and the Schubert with the percussive attack of the piano, both were excitingly played and sung. The Escher Quartet’s keenly calibrated dynamic control heightened the drama of ‘Der Erlkönig’ and there was sharp, arresting individuation of the song’s four voices by Chappuis. The Lieder eines fahrenden Gesellen certainly matched any great orchestral performance of the cycle in terms of tempi, understood and exploited here as a key element of Mahlerian expressive power. The most striking performance of the evening belonged, however, to Ligeti’s Trio for violin, horn and piano, in part due to the piece’s tricky writing, which was handled with precision and aplomb by András Keller, Radovan Vlatkovic and Dénes Várjon. Vlatkovic, whom I hadn’t heard since a Vienna performance of Britten’s Serenade for Tenor, Horn and Strings several years ago, remains one of the world’s greatest hornists, his sound and legato as mellifluous as ever. András Keller was a late addition to the line-up (the violinist should have been Veronika Eberle, who was ill and had to pull out of the first few concerts), but the ensemble sounded rehearsed to a fault and the intricacies of the score were conveyed with dazzling clarity. Verklärte Nacht, sounding ‘lit from behind’, to use Debussy’s phrase, was the final item on the opening program. The translucent overall string tone and sensitive phrasing could be ideally applied to a work like the Siegfried Idyll, and yet, unlike the last time I heard a crystalline, highly refined Verklärte Nacht, this performance didn’t seem quite so surface-obsessed and lacking in meaning. Bach and Busoni were paired in the first half of the second concert. Dynamics once again produced incisive expressivity in the Escher Quartet’s performance of selections from the Art of Fugue, which also seemed sensitive to the charge of rhythmic monotony leveled at Bach’s late counterpoint, and in any case avoided it – the fugues played here sounded anything but rhythmically square. Busoni’s second violin sonata features the two Bachian forms – chorale and fugue – which most influenced his work, and it was in the chorale and subsequent variations that András Keller’s performance achieved real grandeur, assisted by expansive playing and pedaling from Dénes Várjon. Earlier sections of the sonata were not quite as somber or muted as they might have been, with the brightness and sweetness of Keller’s tone doing much to lift the piece. After the intermission, Schumann’s Adagio and Allegro Op.70 was performed with more terrific playing and virtuosity by Radovan Vlatkovic. One of Bruch’s Eight Pieces for clarinet, viola and piano, perhaps by virtue of directly following some extroverted Schumann, sounded somewhere between Schumann and Brahms, and again pleasingly ‘lieblich’. The evening ended with a spirited and thoroughly crafted performance of Beethoven’s ‘Ghost’ Trio with Muriel Cantoreggi on violin, Marie-Elisabeth Hecker on cello, and Izabella Simon on piano. Strong in contrasts between the subject groups, the first movement hit another sweet spot in terms of tempo (boisterous but not rushed), while the second movement continued to point up contrasts, with outbursts that were decidedly Sturm und Drang in character. The final movement emitted a beaming sunniness in a wonderfully unforced, natural way. Kamara.hu doesn’t seem the kind of festival to saturate its programs in Beethoven and indeed this was the only Beethoven work in this year’s series of concerts. It does audiences no injustice, however, to perform less Beethoven, but do it this vividly. For more about the Liszt Academy click here.